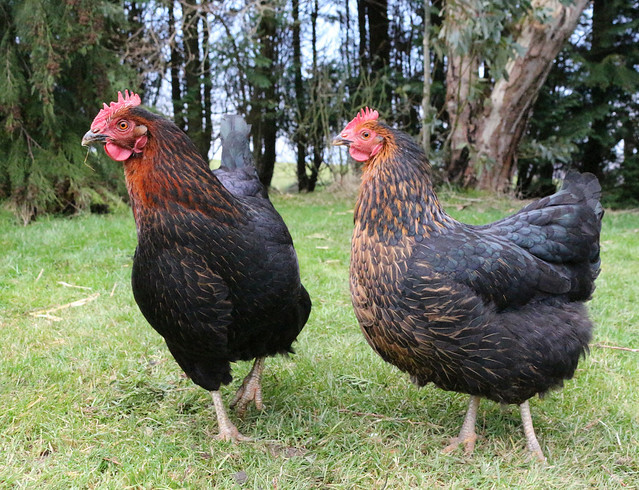 Molly and Dahlia have now settled happily into their new life (although they might not be sleeping so soundly tonight had they seen the weather forecast). Each day they leave their enclosure to scratch under a patch of conifers at the north-west corner of the site. Here they have both interesting morsels to uncover and shelter from the buzzards. They don’t roam far from this area but did once or twice come down to try scratching up some bulbs – a bit of netting has been successful in heading them off, for now. The most exciting thing is that their combs are bursting into renewed redness – a sign that eggs might be on the way again. Not bad for a ten-year old hen, as Molly is. Next > Snow, but not a lot.